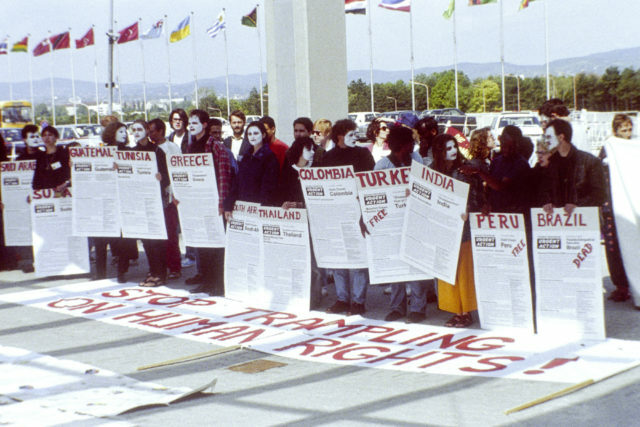 The UN World Conference on Human Rights (WCHR) in Vienna, on June 14-25, 1993, was only the second world conference on Human Rights held by the UN (the first was in Tehran, Iran in 1968). It was attended by an unprecedented 7,000 participants, including from governments, the academy, human rights experts from global and, national institutions, and representatives from more than 800 NGOs. While governments were largely represented by men, almost half of the civil society participants were women thanks to the advocacy of feminists with donors and with the NGO Organizing Committee for Vienna. UNIFEM organized an effective cross-sector caucus of women from government delegations and UN personnel that worked closely with the NGO Women’s Caucus in lobbying for inclusion of women’s rights as human rights in the final document. The Conference aimed to review and assess progress on human rights since the adoption of the Universal Declaration of Human Rights in 1948 and sought to create a renewed effort to strengthen and implement human rights instruments in the new post-Cold War context. It concluded with 171 States adopting by consensus the Vienna Declaration and Programme of Action (VDPA). The VDPA affirms that “the human rights of women and of the girl child are an inalienable, integral and indivisible part of universal human rights” and states for the first time that “gender-based violence and all forms of sexual harassment and exploitation, including those resulting from cultural prejudice and international trafficking, are incompatible with the dignity and worth of the human person, and must be eliminated.” Thus, Vienna laid the groundwork for the full inclusion of the rights of women and girls as a universal human rights mandate, including for the first time the issue of gender-based violence, and for the on-going work to bring a gender perspective into all the work of the human rights system in the future.